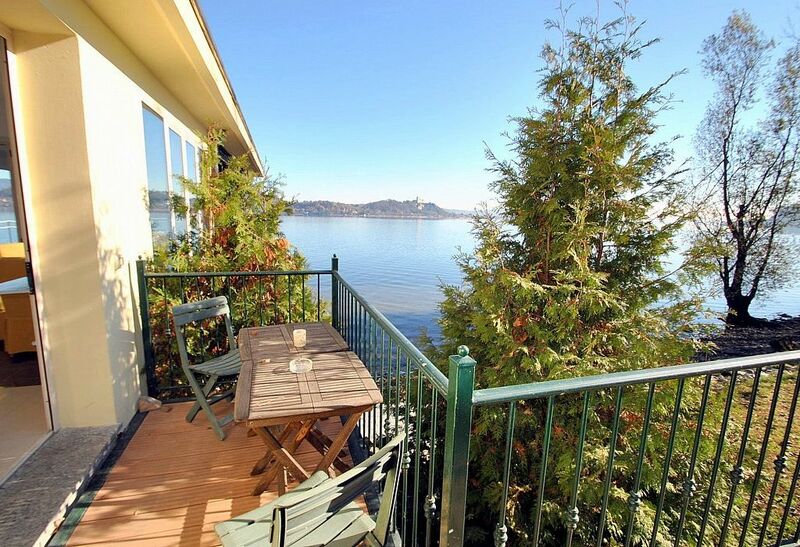 Villathis property is a bright and sunny one-story apartment located right on the Lake Maggiore. It sleeps four people. From Villathis property you will enjoy an incredible view of the lake Maggiore and of the mountains. Villathis property is 55 square meters (590 square feet). It features a shared swimming pool, direct access to the lake, a panoramic private terrace with a view of the lake, a shared garden, winter heating and WI-FI Internet access. You will be roughly 1 km (0.6 miles) from the center of Meina, where you will find restaurants and shops. You will reach Villathis property from the parking area going down a short walkway that cuts through the garden and includes approximately nine stairway steps. To stay at Villathis property you will need a car. You will be able to park it on the premises, inside the entrance gate. The parking space is suitable for at most one car. At Villa Diaspro you&#39;ll find two spacious beaches, one with pebbles and gravel and one with lawn, a nice swimming pool and a dock where at least 6 boats of up to 7 meters each can be moored. The furnishings of the living room are modern and welcoming. The furnishings include a divan that unfolds into a double bed. In the living room you will also find a cooking area. The kitchenette is equipped with a three-burner electric cooker, an electric oven, a refrigerator with freezer, a dishwasher and an Italian-style coffee-maker. The dining table can accommodate four guests. In this room you will find a satellite television (local channels) and a CD player. From the living room you will be able to enter the terrace through a French door. The room also has three large panoramic windows with a view of the lake. You will be able to enter the bedroom from the living room through an access area. The bedroom has a matrimonial bed (160 cm/62 inches, wider than a queen-size bed). The room has a window. The bathroom is equipped with a washbasin, a toilet, a fully enclosed shower and a hairdryer. You will be able to enter the bathroom from the living room through an access area. This villa, in Meina, boasts a gorgeous lake view sleeping 4 people.